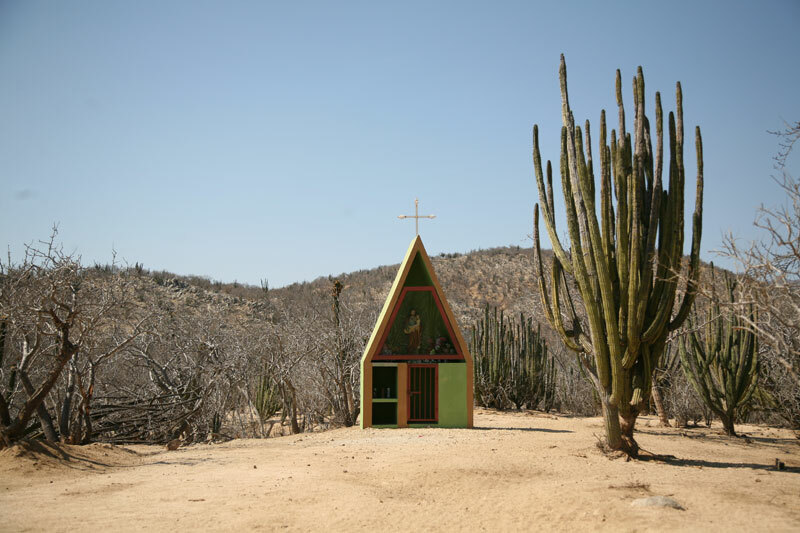 “I believe in an emotional architecture.”, once said one of Mexico’s most influential architects, Luis Barragán. 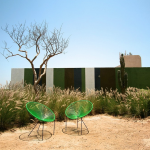 Barragán reinvented Mexican modern architecture with sensuous aesthetics, vivid colors, attention to spaces and light, while accentuating the building’s natural surroundings. 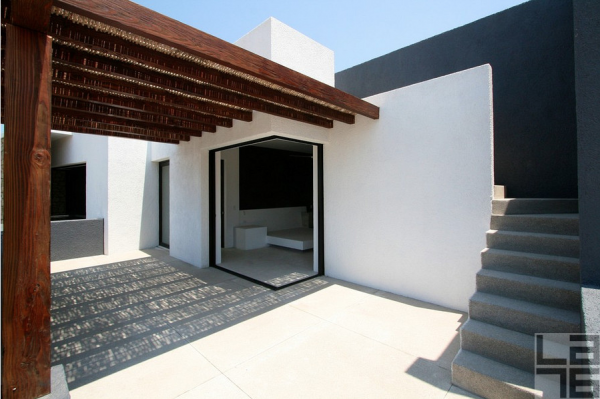 Emotional or sensual architecture is just how we could describe the style of San Jose del Cabo’s new contemporary home by acknowledged Mexican architects Javier Gutiérrez Toscano and Antonio Piá from ColectivoMX. LA76‘s Romana Lilic wrote this article for ESCAPES magazine #7. 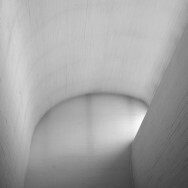 Photographs by LA76, see the full photo gallery here. 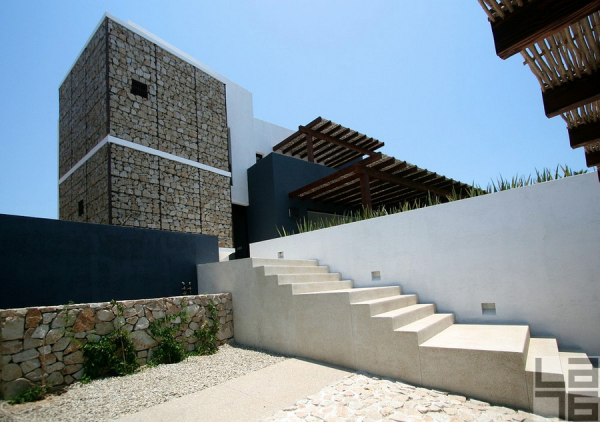 Casa Gavión evokes an emotional reaction at your first encounter. 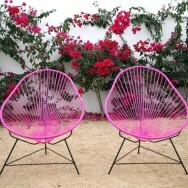 The impact of its massive proportions, volumes, forms, textures and colors will not leave you unmoved, guaranteed. Before continuing to explore its spaces indoors and outdoors, we recommend that you take off your flip flops, as this home is best enjoyed barefoot. Then stretch your arms, open your hands, and get ready for a flood of sensations. Casa Gavión is literally a sensational home. 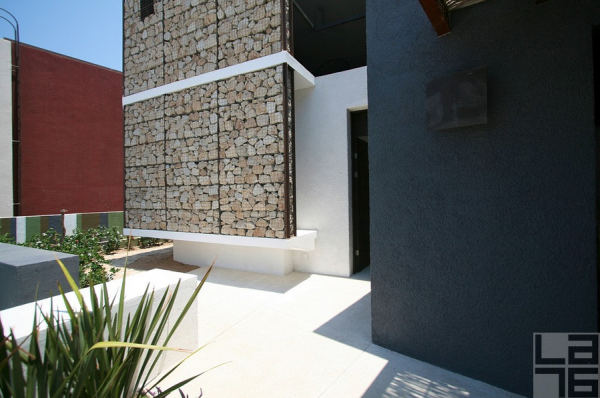 In an awarded architectural studio ColectivoMX, well known for their regionalism in home design, they had four principles in mind during the creation of this impressive nature conscious home; passive pollution of the area by using regional materials and local labor force during the construction, sensibility of the materials by using different textures and reinterpreting their usage, integrating the indoor and outdoor spaces, and thus maximizing the usage of the space, while keeping the home user friendly with low maintenance costs. 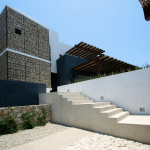 The concept of the home is based on its residents and the enjoyment of all the spaces, where exterior becomes equally important as interior, complimenting the great weather of Baja California Sur. 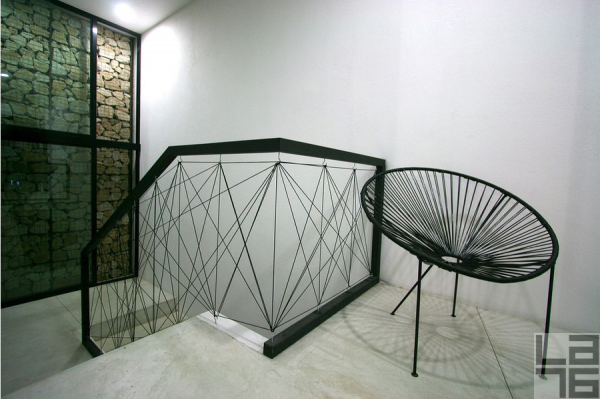 All the spaces in Casa Gavión are looking to the exterior, with each room having its own garden or terrace. Dining and living room open to the large terrace and patio with the pool and lounge area. 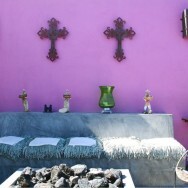 Bedroom on the ground level looks to the cardon cactus patio, and the kitchen opens to the stone patio and the garden. Both master bedrooms on the 1st floor each have their own terrace, and on the 2nd floor there is a large terrace with 360 C views of the Sea of Cortez, adjacent golf courses and the majestic mountains, ideal for sipping wine at sunset and star gazing. 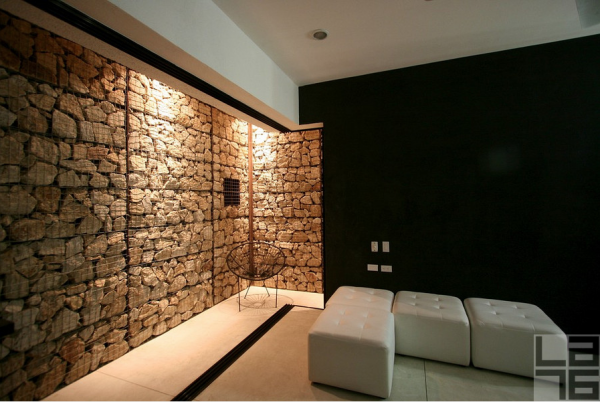 The key characteristic of this home and the essence for its name is the rock wall, “gavión”. 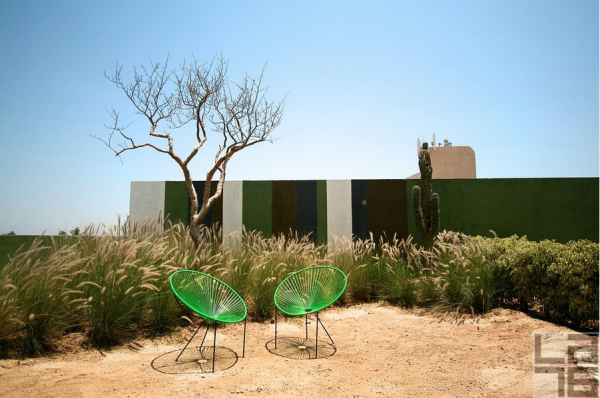 While you will notice gavión at the sides of the federal highway between San Jose del Cabo and Cabo San Lucas, the architect reinterpreted its use and its excellent isolation features to protect the spaces in the home from the sun while at the same time making it function as blinds, letting the air through the wall and cooling the area. 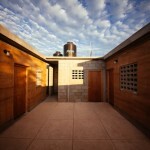 The advantage of owning a home in Baja is being able to live inside and outside at the same time. When walking around, you will notice that this home is without windows: pocket doors have been built throughout the home, so when you are in, you can have them wide open and enjoy the fresh breeze, the salty ocean smell and the birds singing. 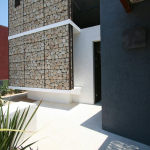 Windows in Casa Gavión function as a security asset: you use your windows when you are not using your home. 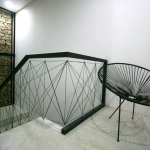 The orientation of the home, cross ventilation, pergolas and a rock wall ensure isolation within the home and eliminate the need to use the air-conditioning. Eternal summer was one of the reasons for different textures, implemented in this home. 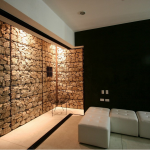 Rock wall, pebble stones, gypsum, stucco, rustic plaster, fine plaster and wood are only some of the materials you will enjoy while walking around barefoot. 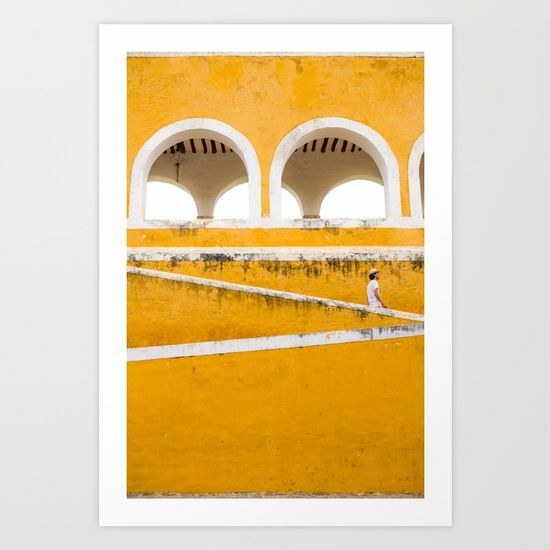 In the main patio alone you can experience fine grass, beach sand, water, stucco and rustic plaster, which you can enjoy depending on your feelings and desires. Let your children play in the house and see how impressed by the textures they will be. The architect’s daughters are walking around barefoot with their hands stretched out, touching and feeling everything that surrounds them with great joy. In the past, hearing the term “ecological home” we used to think of high construction and high maintenance costs. 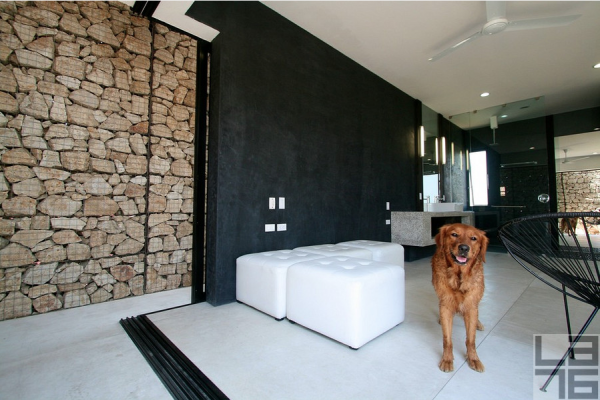 Luckily, with advances in technology, acceptance of the eco standards world wide and with it also lower implementation prices, Javier Gutierrez confirms that the construction costs of this home didn’t exceed the construction cost of any regular home. 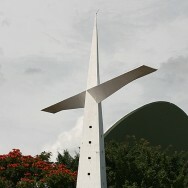 The home has been planed and prepared to help you save energy and money, while protecting the nature at the same time. Prepared system for solar energy will help greatly reduce the consumption of electricity. Grey water usage system is installed and ready to use. Ingenious planning of the pool, consisting of dipping pool, swimming pool and jacuzzi reduces the water consumption generally used in homes with pools. Besides that, the roof, which is the largest source of heat to any house, is isolated with thick high density foam, thus reducing the need for AC. Hard to comprehend for anyone having experienced the summers in Baja, but proven true, is that in Casa Gavión you don’t need to use air-conditioning, even in the hottest summer months. The cross-ventilation, isolation, the mix of indoor and outdoor spaces, open pocket doors, ventilators and breeze assure a fresh wind through all the living areas. Even though, air-conditioners are set for days or moments too hot to handle. Casa Gavión is truly a sensational home. It will tickle your senses and bring out emotions, every day, guaranteed.